You will now learn how to use the holography system you built in Building a Holography System to make transmission and reflection holograms. 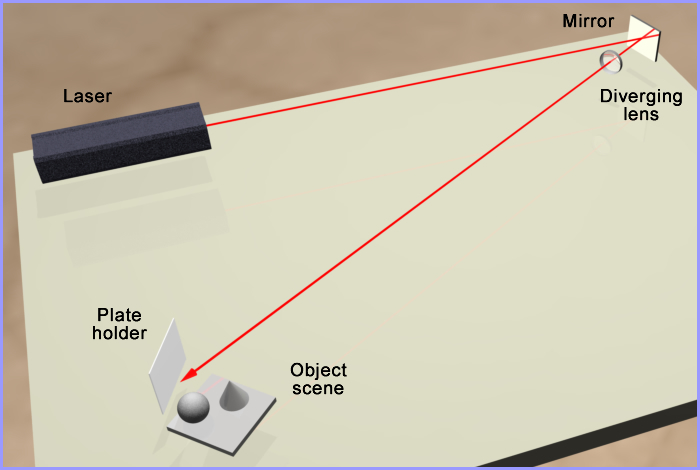 The optical table, components, and the environment must first be tested for vibrations using a Michelson interferometer. You will be using components you've built to create an optical setup for the Michelson interferometer in the next section Testing for Vibrations. Using the Michelson interferometer, you will learn to analyze the various movements in the interference fringe pattern to determine what is causing the fringe pattern to move. With this information, you can eliminated all movements and insure a successful hologram. what additional supplies you need. what recording plate types are available and which one you should buy. what processing chemicals you need to buy and how to mix them. and the processing procedure to develop the hologram after it is exposed. I am covering this information prior to setting up your first optical arrangement so that you can obtain these items ahead of time and have them ready for use when you need them. how to test the hologram's exposure density to make sure you're getting the brightest hologram image possible. The following illustration shows a single-beam transmission hologram setup. Once you have produced your first transmission hologram, you will learn how to make a simple reflection hologram followed by a multi-beam transmission hologram, and a multi-beam white light reflection display hologram. Finally, you will learn how to display and light your white light reflection display hologram. Note: All measurements in the text are given in English units. When you place your cursor over the measurement, you'll see the metric equivalent. I strongly recommend you read through this whole document before implementing it. For assistance in producing these holograms, please contact Stephen W. Michael. Copyrighted © Three Dimensional Imagery, Inc. 1996. All Rights Reserved.